﻿﻿﻿﻿﻿﻿﻿﻿﻿What You Will ﻿Theatre﻿﻿﻿﻿﻿﻿﻿﻿﻿﻿ is Ade, Laura, Nick, and Susanna. We are part of the Crowborough Players' members club. Nick trained as an actor at Drama Studio London, in the Meisner Technique at the The Actors' Temple London, and in improvisation with the Maydays in Brighton and Hoopla London. He specialises in dialects and is proficient in unarmed, rapier and dagger stage combat. Originally from South Africa, he grew up in London and Gloucestershire, and has lived and worked in France, Peru, Spain, and Italy, where, in 2014, he completed a 6 month educational tour of a stage adaptation of The Picture of Dorian Gray. None of these overseas locations are as exotic as Newcastle, England, where he studied for his degree in French and Spanish. He now lives in Brighton and tours regularly round the UK in productions for Comedy Dining, as well as working with school groups as an Education Leader for English Heritage. Nick lives in Brighton. He is big brother to two school-age sisters, one of whom is a budding thespian (the other is lost to the world of horses but he lives in hope). Nick has been involved with Crowborough Community Pantomime since 2014. TENUOUS CLAIM TO FAME: Rehearsed with his musical hero, Tim Booth [of 90's non-ambulatory popsters, James]. ﻿﻿Laura has experience as a theatre tech, director, actor, and writer. She trained in performance, Meisner, improvisation, Shakespeare and technical theatre at Grossmont College California, The Actors' Temple London, The National Comedy Theatre San Diego, City Literary Institute Drama School London, and has taken short and intensive courses at the Academy of Creative Training Brighton, with the Maydays Brighton, and the Royal Shakespeare Company Stratford-upon-Avon. Laura works for Crowborough Netball, a netball coaching school for children and adults, and co-founder of Square Films, a film making collective in Brighton. She worked for many years as an English as a Foreign Language Teacher in the UK and Indonesia, teaching children from the age of 7 upwards, and has worked with school groups as an Education Leader for English Heritage since 2012. Laura has been involved with Crowborough Community Pantomime since its inception in 2012. Born in Sussex, Laura grew up in the Cotswolds and Stratford-upon-Avon. After a few years roaming the globe, she moved to Crowborough in 2002 and has stayed put, (give or take a few years in the USA). She has two children, two dogs, two chickens, and one husband. DBS Checked. Equity Member. First Aid Certificate. Children in Entertainment Chaperone Licence. TENUOUS CLAIM TO FAME: Was briefly big in Egypt after appearing in a Nubian music advert filmed in Cairo. PROUDEST MOMENT: Having her script translated into Chinese. "Am I in the light?" Ade is a teacher of Politics and Beliefs & Values at Secondary level as well as Head of Year. He has been a Scout leader for over 10 years and is an Elder at Crowborough Methodist and United Reform Church. Involved in theatre since childhood, Ade is Chair of Crowborough's community theatre group, The Crowborough Players and regularly produces, directs, and performs in local theatrical productions. Ade has taken on many admin and crew roles for the panto, as well as appearing on stage as a Dame. As well as a PGCE from Brighton University, Ade has a degree in International Studies with Political Science from Birmingham University. Ade is from Stoke-on-Trent and has lived in Crowborough for over 10 years. 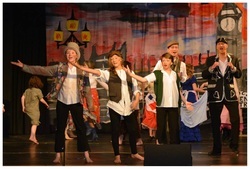 Ade has been heavily involved with Crowborough Community Pantomime since its inception in 2012. He is married to Su; they have two children and many feline and avian pets. DBS Checked. Advanced First Aid Certificate. TENUOUS CLAIM TO FAME: Performed on stage in Lionel Bart's Oliver with Robbie Williams. PROUDEST MOMENT: His mum announcing to the audience of a panto, during the show, "Adrian Morris has been on stage with Robbie Williams". Susanna was trained at the Nest Brooking School of Ballet, studying all aspects of the performing arts before embarking on a professional career as a modern dancer, working in England and abroad. Head girl for several dancing groups, she has worked alongside several famous names in large shows and toured the world dancing. Having gained experience running her own dance groups working with choreography and costuming, when she settled down to start a family, she also started the Susanna Cox Academy, which has now been growing successfully for over 18 years. Alongside running the school, Susanna also works as a performing arts examiner for the Professional Teachers of Dancing Association (P.T.D) and is a member of the management committee for the Professional Teachers of Dancing. Susan has been involved with Crowborough Community Pantomime since its inception in 2012. Click here to see www.susannacoxacademy.co.uk.